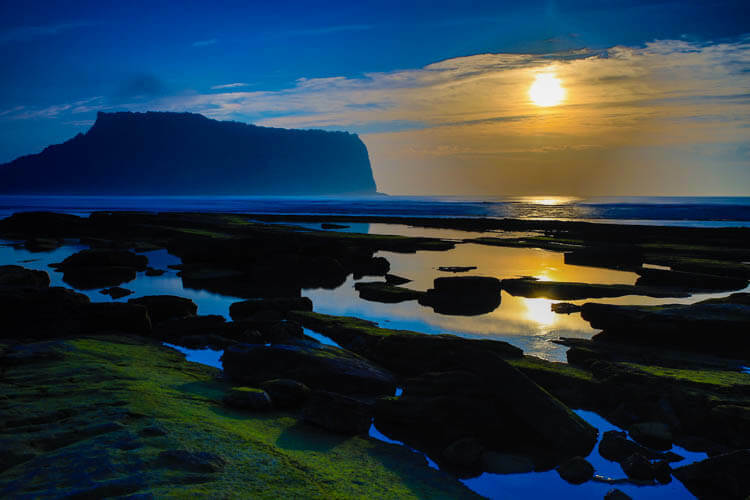 Jeju Island is South Korea’s only tropical destination and makes a great destination for a quick getaway from Korea. It’s a hot spot for honeymooners, beach lovers or outdoor enthusiasts. With literally hundreds of flights a day from Seoul, it’s actually the worlds busiest air route. As it’s only a quick one hour flight from Seoul, Jeju island should be on every Korean travelers’ bucket list. In 2011 Jeju Island was named as one of the New 7 Wonders of Nature, and is also home to several UNESCO World Heritage Sites. 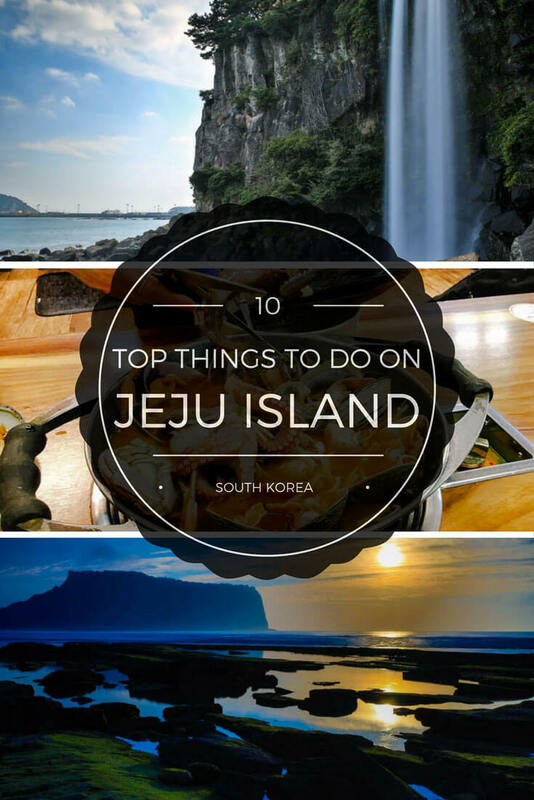 Here are our picks for the top 10 things to do on Jeju Island. The early morning wake-up call is well worth it as you stand at the beach and watch the sunrise over Seongsan Ilchulbong Peak (also known as Sunrise Peak). The beach is mostly made up of black lava rock, which makes for a great viewing platform with countless pools of still water to reflect the glow of the sun as it rises above the 5,000 year old volcanic crater. You’ve already gotten an early start on the day, so you may as well make the most of it. Just a few minutes drive from where you caught the sunrise you can climb the 182 meter tuff coned Seongsan Ilchulbong Peak, which was designated as a UNESCO World Heritage Site in 2007. The hike takes about 25 minutes to climb on a well graded trail. Views of sheer cliffs keep your attention as you make your way to the top of the tuff cone crater at the top. After enjoying the panoramic views at the top be sure to take the detour on the way down to the women divers house at the black sand beach. The women divers performance is at 1:30 pm and 3:00 pm daily. They don a diving suit, grab their fishing net and disappear for a few minutes below the surface. When they come back up they show off their catch of fresh seafood and even slice it up right there offering visitors a chance to taste the freshest seafood around. Entry to the park costs ₩2,000 ($1.75), which is used for the maintenance and upkeep of the facilities. One thing you’ll notice while driving around Jeju is the abundance of fish tanks lining nearly every road in the small cities. It took me a few days to realize they were all restaurants and the tanks are all for the fresh seafood. If you like seafood, then haemultang is a must try. I got a recommendation to check out the restaurant Samseonghyeol Haemultang and I knew as soon I found it that I was in the right place. The place was packed and even had a waiting list to get a table, but the wait was only about 20 minutes. I waited and it was definitely worth it. The tables are traditional Korean style where you are seated on the floor and I got a lot of looks since I appeared to be the only foreigner in there. Haemultang is a spicy seafood stew that they cook live right in front of you. I should mention that everything is alive when they start cooking it. 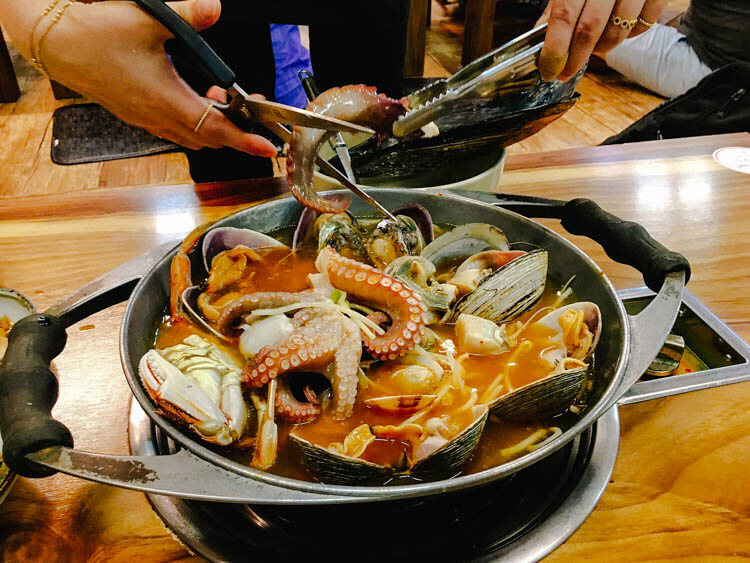 That’s right: octopus, clams, muscles, scallops, abalone and crab all cooked in a pot at your table. I love making lobster at home, but this made me wonder what I was getting myself into as I watched the seafood twist and slither as it started cooking. The staff come up every few minutes and prepare the dish, cutting up some of the seafood and letting you know what is ready. Just when you think you’ve eaten everything and there is nothing but broth left, they add noodles to it and it will be the best spicy seafood noodle soup you’ve ever had. I left stuffed, but with a big smile on my face. The medium size portion will satisfy two people and cost ₩60,000 ($53) and was worth every bit. 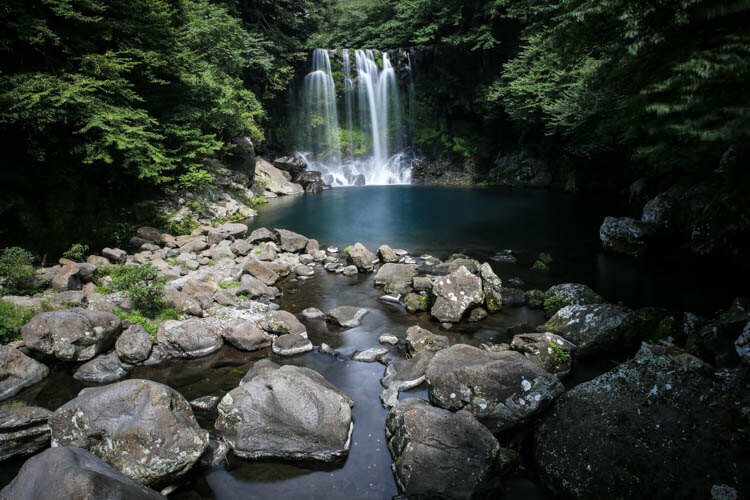 If you only have time to visit one waterfall on Jeju Island, then let it be Jeongbang Falls. It’s the only waterfall in Asia that falls directly into the sea. The rocks beneath it form some small pools and it was a welcomed place to cool off with the waterfall spraying mist on you. The rocky beach is a great place to relax for a bit and watch the waves roll in. When it’s hot and humid outside, one of the most refreshing things you can do is a explore a cave. 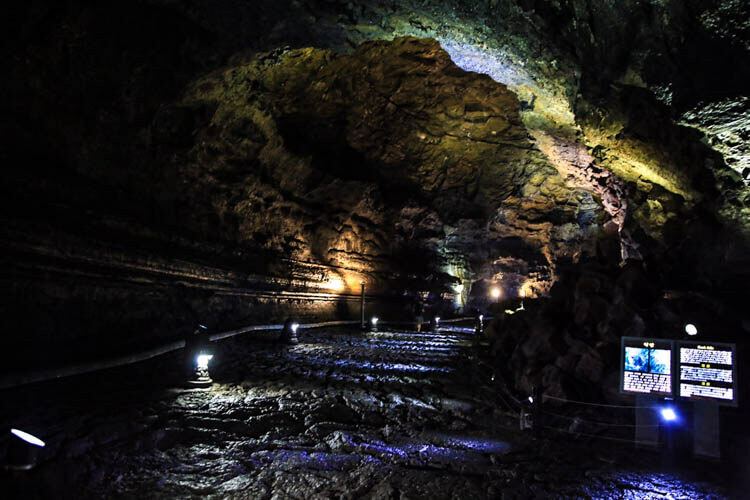 The Manjanggul Cave is actually a lava tunnel that stretches on for 13 kilometers (8 miles) and is also one of Jeju’s UNESCO sites. In order to protect the cave and organisms (bats) that call it home, only 1 kilometer of the cave is open for public access and a visit takes about an hour. The cave is open from 9:00 am to 6:00 pm daily (closed the first Wednesday of the month) and entrance costs a reasonable ₩2,000 ($1.75). 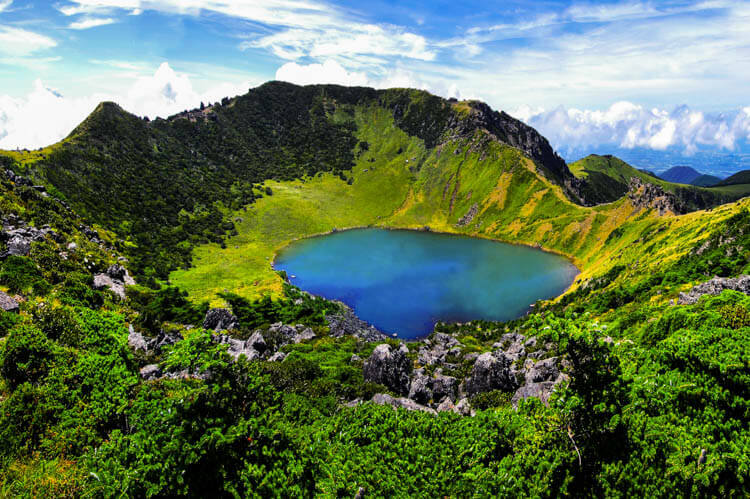 While Jeju Island may be known more for it’s emerald waters and sandy beaches, it also has the tallest mountain in Korea at 1,950 meters (6,398 feet). Hallasan Mountain rises up in the center of Jeju Island and has over 350 volcano shaped peaks. Hallasan National Park is also home to over 4,000 animal species throughout its vertical ecosystem. The park is home to multiple hiking trails, everything from a few miles to a 12 mile round trip hike to the high point Dongneung Peak. Weather is constantly changing on Hallasan, so be prepared for high winds and rain no matter how blue the sky is when you depart. During my visit I drove nearly the entire coastline around Jeju Island. The coast ranges from sheer cliffs, black sand beaches to golden sand like at Gimnyeong Beach pictured above. I prefer quiet beaches and packing a lunch over busy beaches with lots of amenities. Whichever beach you prefer, the same cobalt-blue waters will greet you and make you want to stay. If you pay a visit to Gimnyeong Beach, consider a visit to the Manjanggul Cave which is located nearby for an escape from the heat. Want to re-live your youth and remember what the corn field mazes used to be like as a kid? At Gimnyeong Maze Park you can do just that. The maze itself is in the shape of Jeju Island and takes anywhere from 5 minutes to 50 minutes to complete. There are viewing platforms setup along the maze so you can communicate with a friend to try and navigate through it. At a cost of only ₩3,300 ($3) for adults and even less for children it’s some fun outdoor entertainment. There is also a concession stand for snacks or ice cream to cool off on a warm summer day. A visit to Jeju Island wouldn’t be complete without trying it’s most famous dish: barbecued black pork. Just look for a little picture of a pig in any city on Jeju and you’ll easily find yourself a Korean BBQ restaurant. My favorite part about Korean BBQ is that it’s cooked right in front of you on your very own grill built into the table. 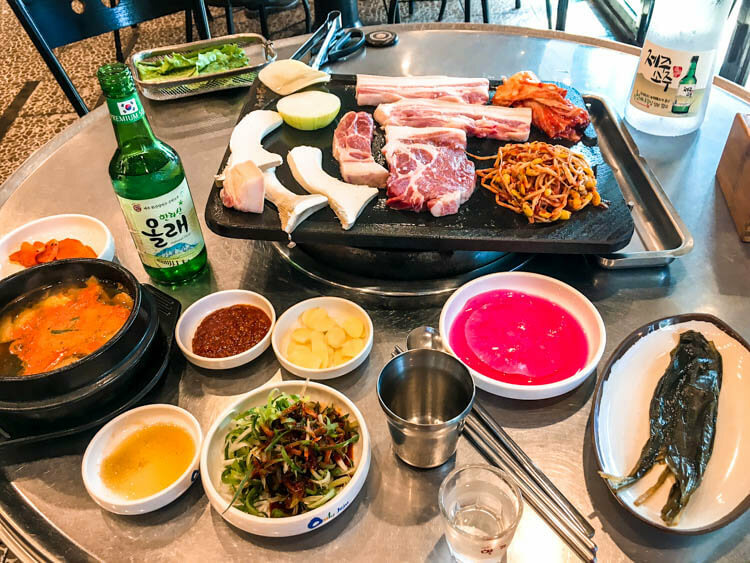 As you can see you’ll get a full spread to try some other local specialties like kimchi, seasoned bean sprouts, radish and cucumber dishes. I’ll be honest, 90% of the time I have no idea what I’m about to try but more often than not it’s pretty tasty. 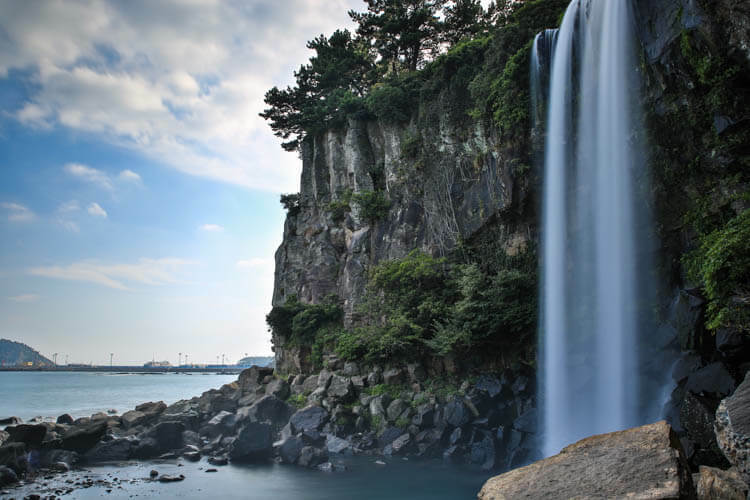 Cheonjeyeon Falls, named “The Pond of God,” consists of three different waterfalls. Each is unique in its own way, but my favorite was the second waterfall pictured here. If you’re a photography nut like me, you’ll find a way to spend an hour here snapping pictures from different angles. There is a clear path leading between all three waterfalls and takes less than an hour to see all three. Entrance to the park will set you back ₩2,500 ($2) and it’s open daily from 8:00 am to 6:00 pm. Tim Davis is an independent globe trotter based in Bordeaux, France after living in Italy, South Korea and England. When I am not off traveling with my wife I enjoy playing softball and hiking. I am so bummed out that after living in Korea for two years we never made it to Jeju. We have been just about everywhere else but Jeju actually! We backed out when we realized we couldn’t rent a car because we were foolish not to get our international drivers license in time before we were leaving the country. Although we have been missing Korea alot these days so we will be back! I had no idea that their waterfall was the only one that flowed into the sea in Asia! I can’t believe I had never heard of Jeju Island! Waterfall that goes into the sea! Wow! I would love to do all of these things! Jeju Island seems like a paradise for a nature lover like me. It seems that I’ve come across quite a bit about Jeju in recent weeks. Looks excellent, especially that crater hike. Oh, and the stew, too. What a beautiful destination. I love that after the hike to the top of the volcano you can be rewarded on the way down by watching the women divers and eating the catch. Sounds like a great experience. 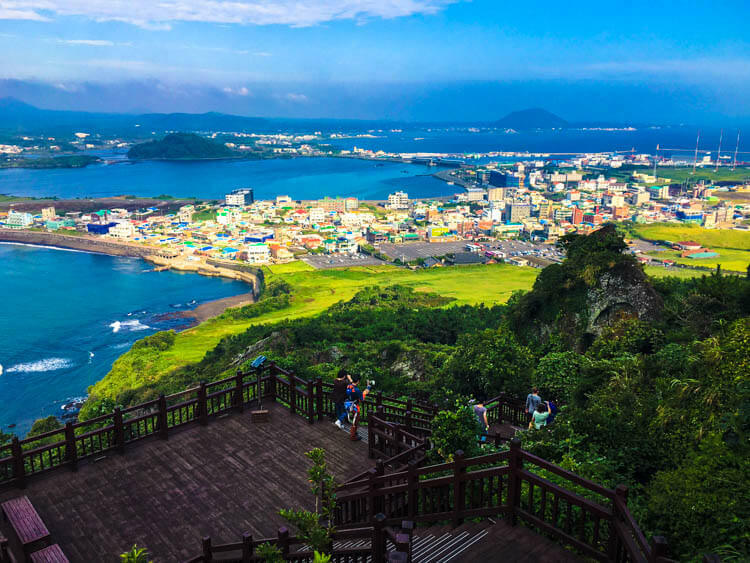 All of this looks absolutely incredible, I had no idea Jeju Island had so much to offer! I am all about that Jeongbang Falls, I\’d be happy to post up there with a book. That first photo of the sunrise had me swooning, but after seeing the food I was sold. How soon can I get there? Pardon the ignorant question: How is wine in S Korea? 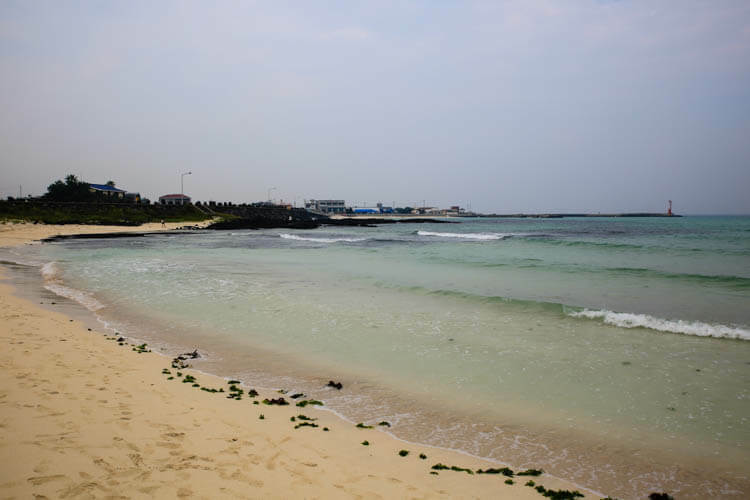 Curiously, this is the second article about Jeju island that I read in the past couple days. I already got a feeling that it has to be on our list when we finally make it to Korea. Somehow, out of all wonders, the maze caught my attention the most. Perhaps, it was its vivid green color or an unusual shape (who knew that a labyrinth could be in a shape of an island 😉 ). Thank you! I had no idea Jeju Island was one of the new 7 wonders of nature, but after reading your post, I can see why. From hiking volcanoes to watching women divers and exploring caves and waterfalls, there’s so much beauty. Thanks so much for sharing! omg those waterfalls and the crater too. Highest point in korea I didn’t know that! My friend just told me about Jeju island. I didn’t know it existed and now I’ve read about 3 blog posts about it! Getting more popular maybe? A must do is- hire a scooter or buy one locally, we brought ours at a tiny mechanic shop in Jungmun for $60 and when leaving sold it for $60. Drive around the island, on the outskirts along the coast. Leaving from Jungmun we meandered through garlic infested paddocks towards…I forget all the names now but we went clockwise around the island. Jungmun to the west coast us gorgeous, very rural and adventurous. I love Korea for its strong cultural bonds and their old traditions including their traditional Jeju stone homes and fences down to their old clay pots sitting in their backyards holding their precious kimchi. I love how you can walk in the city and see dried squid drying in the sun along the roads an old wrinkle ajuma waving her broomstick smiling toothlessly at you and then next to her is a modern light flashing slim screen advertising Hite beer. The dynamics of modern vs traditional blended well with me. I miss my sweet Jeju. Ps don’t forget to visit the tea plantations – one of my favourite spots to chill up high on the mountain on the Jungmun side, access by car or scooter. Oh so many great spots.